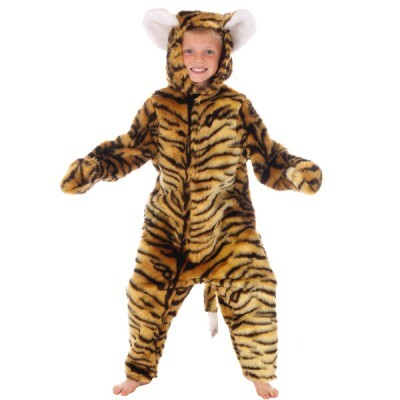 This cute little tiger costume is perfect for kids who want to stalk through the house, hunting for their dinner - or some sweets. It comes as a one piece suit, made of a furry material with a golden tiger-skin print. The hood has a pair of sweet white ears while the end of the tail has little white tip. The whole suit fits together using quick and easy Velcro with a pair of mittens you can use to cover the hands. 2 to 3 years 98 cm 39"
10 to 12 years 152 cm 61"